My first bake (and blogpost) of 2017 had to be one of the delicacies that I only found love with in 2016: blueberry muffins. I feel like 2016 brought lots of great new foods into my life, and this is definitely one of them. So, this week after turning the kitchen upside down with flour and icing sugar, I snapped a few photos of my final product and decided to share the recipe. I reckon that the only way I could make up for not blogging in a while (which was actually justified by my extremely busy schedule and mock exams over on my twitter), was to give you this recipe for these ultra delicious muffins. Firstly, I'm going to comment on how easy these are to bake!! The most time consuming thing for me was cutting the greaseproof paper and folding it a few times - and even that is completely optional. 1. Firstly, I preheated my oven to 200C (Fan) and cut out all of my muffin cases which I made out of greaseproof paper. I just simply did this for the traditional and rustic muffin look, but you can buy muffin cases from almost anywhere. I had a muffin tin (recommended because cupcake tins can be too small) and, I placed a muffin in every other pot - so I put 6 muffins in the oven at a time. I did this because I was aware that the greaseproof paper might be affected by over crowding. 2. Next, I creamed together the butter and sugar using an electric whisk. After lightly beating the eggs, I gradually added them into the butter and sugar and went back in with the whisk for a few minutes. The mixture doesn't look gorgeous at this point, but hang in there. 3. My plain flour was added gradually, along with the baking powder and nutmeg. With the nutmeg, you can add as much or as little as you like - I was a bit generous with it in my bake just because I LOVE the taste of it. You could also add a pinch of salt, but I left this out. 5. The muffins can then be spooned into their cases and placed in the oven for around 20 minutes, until golden brown. At this point, the mixture should be thick, not runny. I always like to check a cake with a metal skewer too to check that it's baked through. 6. When the muffins are done, leave them to cool right the way down to room temperature. It's important that they cool because if you put the frosting on whilst they're warm, the frosting will melt. 7. For the frosting, I didn't measure my quantities because, again, I did it by preference. I roughly did around 100g of royal icing sugar and three teaspoons of cream cheese (I used full fat for full flavour). I whisked them together until the consistency was nice and thick. (It's optional to add some vanilla flavouring to the frosting, it can help take away any bitterness from the cheese). 8. 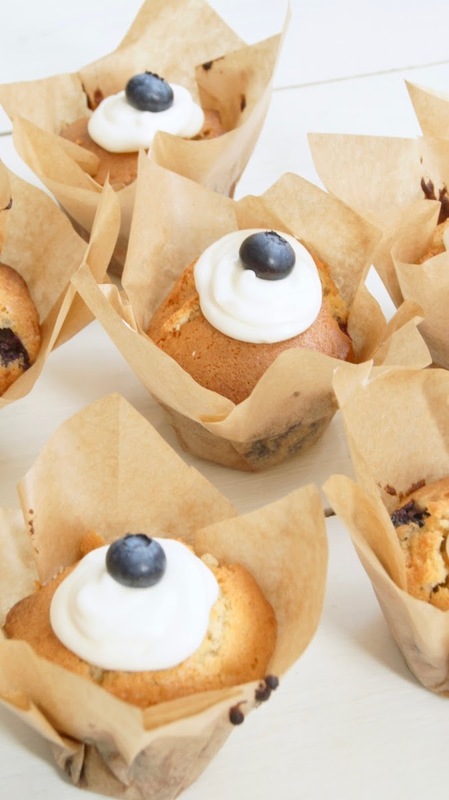 Using a piping bag (or you could just use a spoon), I piped a good old dollop of cream cheese frosting to the muffins and topped it off with a little blueberry. I'm really happy with how these went! They are very, very delicious too and I can't wait to bake more of them in the future.